The first this we have to do is add another pocket to the other side of the dumpster. It’s a simple matter of Control-C to copy and Control-V to paste it, then we drag it to the other side and rotate it 180 degrees. We can use a guide line to show the upper cornet of the pocket, then use the nudge tool to get it aligned just right. You may have noticed we are designing this dumpster full scale. At the end of the process we will shrink it to 1/87th size. It’s much easier, avoids having to do a lot of math, and Sketchup was really intended for architects to do buildings. It doesn’t always like very small measurements. Finally, a design issue! 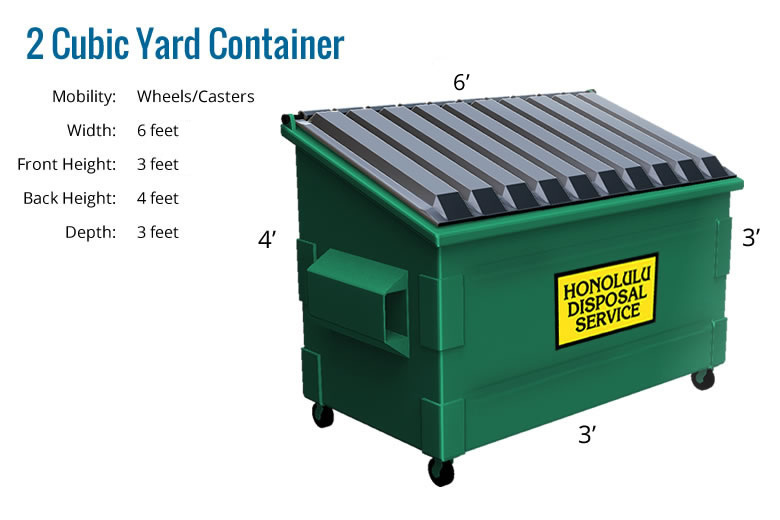 You may notice that many of the dumpsters have wear plates welded on in front of the pockets to protect the sides as the forks of the truck go in and out and so a fork doesn’t go through the front if the driver is a little off. Is this the kind of detail an average user would notice? Probably not, but it does add to the model and is easy to do. Since it makes the wall thicker, not thinner, I can add it without worrying about breaking a design guideline, too. I am not sure how thick the plates are, but this is a situation where if we stick to scale absolutely, the detail may not be noticeable on the model. But, a scale inch should be enough, and that’s how thick we will make them. I just noticed the reinforcements by the wheels. Although I’m actually ahead of the blog in the design of the dumpster, I’ll have to remember to add them later. I am looking at the corner of the wear bar. Sharp corners don’t survive well in real life, and often a slightly rounded corner looks better in my mind. I think we’ll round the vertical edge of the wear plate. There is an add-on for Sketchup called “Rounded Corners” of all things. it allows us to select the edges, the radius of the edge we want and then does all the hard work for use. The last thing we’ll do on this post is make a wheel, copy it three more times, and put them in place. We will make each wheel a group (think sub-assembly) so later on we can delete them, or change them, without effecting the rest of the model. 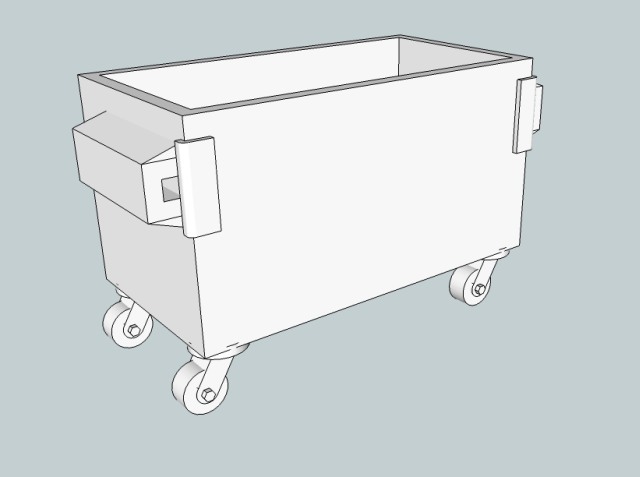 Suppose we want to make a version without wheels- we’ll have the basic dumpster and only have to make some small changes. Because it will stick out Shapeways considers the wheels as wires, even though they’re not round. Because they are not supported on both ends, they’re unsupported wires. Back in post two I included a chart that shows the minimum diameter of a wire in the WSF material in HO Scale, which is 3.43 scale inches. That means no interior dimension can be less than 3.43 inches, and since we want this to print in the polished materials, we need it to be about 3.8 inches. 4 inches is safer though, and a half a scale inch more or less isn’t going to matter much to how the finished model looks. I had to completely redo the wheels. The first time I made parts too thin. When I made them thick enough, the wheels didn’t look right. I started with wheels 6 inches in diameter, which was actually large than I wanted, but the second time I went up to 8 inches. These are bigger than the wheels I’ve seen in real life, but the proportions between the different parts looks better when they are made thick enough to meet the design criteria. This video is a little longer, but again I have chopped out parts and sped it up between 2 and 4 times the actual speed. I think the base for our dumpster is almost done. We still need to add those reinforcements to the lower corners, then we’ll start on the lids. Here’s how the dumpster looks so far. If you compare it to a picture of an actual dumpster the wheels are too big, but printed in 1/87 they’ll look fine. Put behind a factory or store it’s a small detail that will add to the scene, not be the scene.